As we see our lives integrate more and more with technology, we will steadly see our reality being changed, impacted or altered by technology in the way we view it. This is the segment where Augmented Reality comes into play. Augmented reality (AR) is a term for a live direct or indirect view of a physical real-world environment whose elements are merged with (or augmented by) virtual computer-generated imagery - creating a mixed reality. The second definition is that of Paul Milgram and Fumio Kishino in 1994, Milgram's Reality-Viruality Continuum. They describe a continuum that spans from real enviroment to a pure virtual enviroment. In between these is Augmented Reality (closer to our real enviroment) and Augmented Virtuality (is closer to virtual enviroment). But how does the above translated into our everyday lives. Well think about walking in a not so familiar city and looking at a building that is quite beautiful but you don't know anything about. Of course you could look at a guidebook, a map or other common forms of information. However flipping through these takes a little searching. Instead you could take out a device, say a mobile phone with Augmented Reality software on it. Using this you could simply point your camera at the building and the software would automatically recognize it and supply you with information pre-installed or from the web. These types of AR software work with onboard features of your mobile phone or rather smart phone. 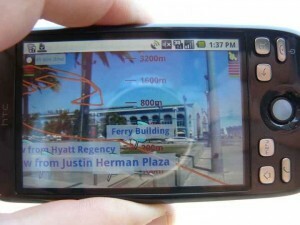 Functions like a camera, GPS and built-in compass are some of the dependencies. Some websites like Twitter are currently developing means to take advantage of data take from GPS on your phone in order to use with AR. Although it is opt-in, so you won't tweet from your mobile device by default with GPS information. But being able to see what has been tweeted in your current location can be a very useful tool indeed. Another example of Augmented Reality is one by Nokia. Say you get up in the morning and while you stare out of the window you see the weather predictions of the day (and comming days) plus any messages you have on your e-mail account displayed on the window. See a video representation of it on YouTube. The possibilities are quite amazing with Augmented Reality technologies and are currently in an early stage. Some possible future applications here. Security is a hot issue these days, anti-this and anti-that software is being sold to the not so computer savvy consumer making them feel less burden and safer while using their shiny machine.